Despite only publishing two issues of The Ryerson Free Press (RFP) last year, the Continuing Education Students’ Association of Ryerson (CESAR) paid out almost $50,000 in operating fees. According to the CESAR’s operating budget for 2013, over $25,000 was paid in wages to editors and nearly $16,000 was paid in expenses, which CESAR president Shinae Kim said were mostly legal fees. Kim would not comment on what the legal fees were. The remaining funds were allocated to the costs of printing, sub contracts and the Canadian University Press. CESAR represents roughly 16,000 part-time and continuing education students and the RFP was their monthly paper. However, it has been one year since the newspaper last went to print and efforts to revive the now-defunct paper have stalled indefinitely. According to the RFP website, the newspaper is dedicated to “providing progressive coverage and investigative journalism to Ryerson’s campus and neighbourhood, with a focus on issues relevant to continuing education, distance education, and part-time students.” The last RFP editor-in-chief, Clare O’Connor, was in her first semester with the newspaper before leaving abruptly after the September issue had gone to print. It is still not clear why O’Connor left and, according to the RFP mandate, the paper can’t publish without a sitting editor-in-chief. “There have just been a lot of happenings that I’m not allowed to talk about,” said Kim. A 2012 interview with former CESAR executive Annie Hyder revealed that undisclosed legal proceedings had taken place between CESAR and O’Connor, forcing the paper to halt operations. “Unfortunately I can’t really talk about the editor-in-chief because we are in legal proceedings with her,” said former CESAR executive, Annie Hyder to The Eyeopener in a 2012 interview. According to the union’s audit for 2011 to 2012, CESAR had collected approximately $1.1 million in revenue and the RFP accounted for $68,404 in operating expenses. Kim could not comment on where the money that was not used for the RFP in 2012 had gone. 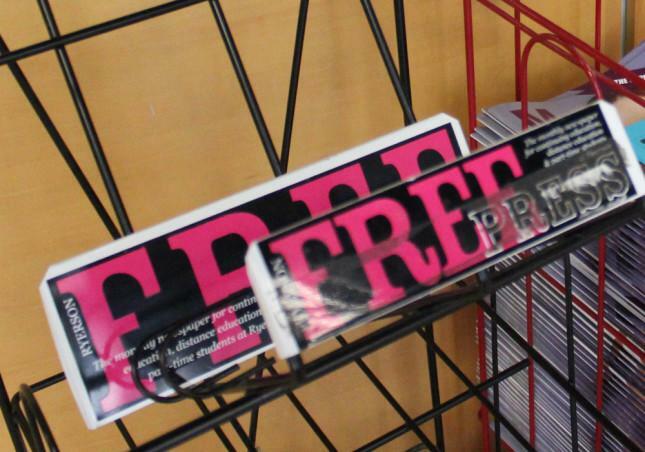 The paper was the only publication on campus that offered cash incentives to its contributors. On average, students made $40 per article. However, several sources that had written for the RFP said that writers were often not paid. An anonymous source that had worked at the RFP for several years as an editor said that CESAR, in general, was a very “toxic” environment. She also said O’Connor had been on a probationary contract and that she was not treated fairly. “It [pushing out O’Connor] was part of the process to undo the paper,” said the source, who also alleged that CESAR was looking for an excuse to cut funding. Initially, CESAR worked to fill the vacancy O’Connor had left behind and called on applicants to apply for the $15,000-a-year position. But, the most recent job post for the editor-in-chief position was made last November. Kim would not comment on whether or not they were actively looking for a new editor-in-chief. “If it is the will of the members to have The Ryerson Free Press as a CESAR service again, the RFP will be re-launched,” said Kim. Kim said that, in the past, surveys have been done to find out if there was a demand amongst union members for a student newspaper. However, she was unaware of what the results of the surveys were and would not comment. CESAR students said that if they’re paying for the RFP’s operating fees, they want to see a product. “They [CESAR] should be putting out a newspaper if the fees are coming out of my tuition,” said part-time student Saeiha Irahman. Repeated attempts to reach O’Connor for comment were unsuccessful. Something is definately awry at CESAR. Two different articles pretty much paint a picture of the dysfunction of the CESAR leadership.